The original concept for the engine in this car was drawn on a bar napkin by one Mr. Chuck Beck (of replica spyder and 904 fame, among other things). The way he tells it, his fiberglass Beck Spyder was only legal for a certain class of competition if it carried a Porsche-based four cylinder engine, and he figured he could get a lot more power out of a cut-down 911 engine than he could from any 356 or 914 sourced aircooled four. 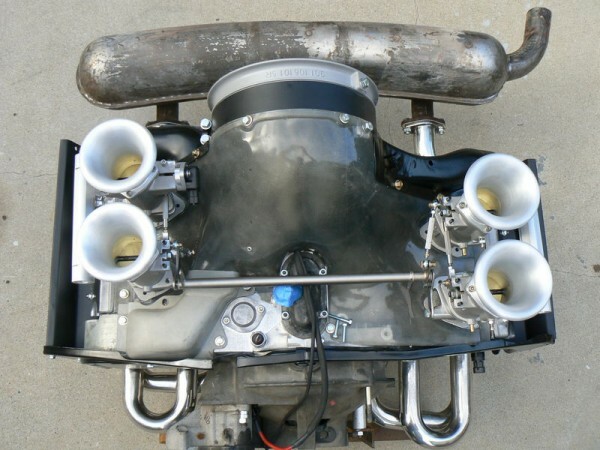 Not long thereafter, Chuck was fabricating a scad of custom engine components to take the project to fruition, including a crankshaft, camshaft, case, and valve covers. In the early 1990s, Dean Polopolous determined that the six-into-four concept was perfect for delivering big power numbers to 356 owners, as it is extremely difficult to fit a 6 cylinder in a 356, but with his POLO engines you can have 6-cylinder power in a 4-cylinder sized package. Polopolous worked with Gary Emory to build "Desperado", a four-cylinder 911 engine powered 356 race car. While a few of these engines have found their way into quite a few 356 chassis, this particular engine has been dropped into the back of an unsuspecting 912, because why not? It if fits like a glove in a 356, it'll have plenty of room in a 912. Porsche's little four cylinder has always been looked on as lesser than the 911. 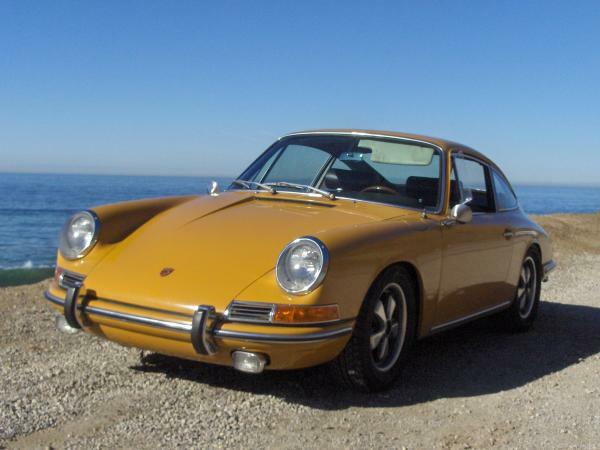 912s do weight a bit less than 911s where it counts, behind the rear axle, which does provide a handling advantage. So what if you could create a 912 with more power than any long-hood 911, and still retain the weight advantage? That's exactly what Pompolo Design's Polopolous and Chris Pomares aimed to do with this Bahama Yellow 1967 Coupe. When the 912 was assembled, it was because the 911 was perceived as being more expensive and too luxurious in comparison to the 356 it replaced. The light weight was a byproduct of offering a stripped down inexpensive entry level chocolate in a 911 candy-coating shell. The extreme power offered by the 2.4 liter twin-plug POLO installed in the back of this 912 comes with all of the advantages of a late-model flat-six, without all of the disadvantages brought on with added weight. Pomares heard word about Polopolous' engine work for 'Desperado', and immediately knew that he needed one of those engines in the back of a 912. It would be the perfect all-rounder car, great for balanced canyon carving, excellent for long tours with his wife, and even great for slogging around the daily grind. The engine, in this case, is one of the most advanced pieces that Polopolous has assembled. It features a unique Pompolo engine case with five main journals. 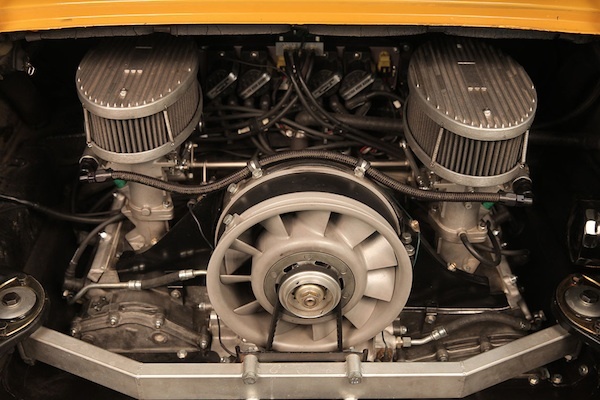 The crankshaft was hewn from a solid hunk of 4340 billet chrome-molybdenum, as were the two overhead camshafts, which were ground to 993 Carrera RS specification working with 993 twin-plug cylinder heads fitted with lightweight titanium valves. With a precisely matched bore and stroke to achieve the power they were looking for, the engine ended up at 2.4 liters. This assemblage of parts produced an engine 3 inches longer, and weighing only 20 pounds more than a standard 90 horsepower 912 engine. That tick of extra weight was an acceptable trade off for more than doubling the power output and greatly increasing drivability. While some POLO Motors engines are carbureted, this one has been endowed with a trick custom EFI setup (a quartet of 50-mm TWM throttle bodies), as well as an Electromotive Tec-GT ignition system. When all is said and done, the engine performed perfectly, delivering 148 horsepower and 127 lb-ft of torque to the wheels. Keep in mind that Polopolous' shop is located more than 5900 feet above sea level in Denver, Co. Calculating losses at altitude, the car should put down about 190 horsepower on any dyno located at sea level. Calculating engine power should put gross output somewhere well over the 200 horse barrier, considering the drivetrain losses involved. While this masterpiece was being assembled, Pomares was out searching for the car in which to install it. 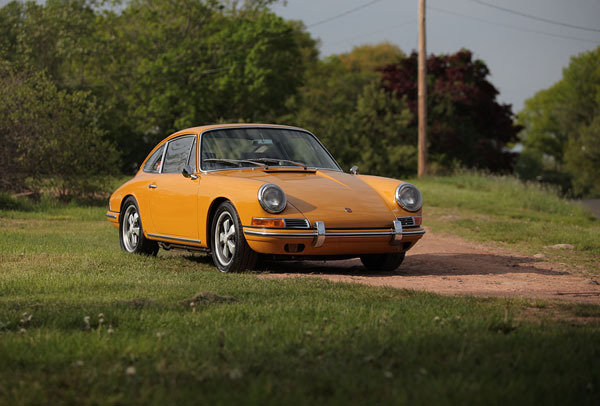 A local mechanic had mentioned that he had just taken delivery of a gorgeously original Bahama Yellow 912 that would be perfect for the task. The paintwork was deemed acceptable, the car was determined to be cancer-free, it had covered only ninety-something thousand miles, and was delivered with the 5-speed 901 transmission that Pomares was seeking. The car quickly received a raft of suspension components, making it ever more capable with every aftermarket bit that was installed. He then decided to liven up the cabin a bit by installing some custom-reworked seats with inflatable bolsters, and higher sides added to the bottom cushion for cupping the driver in place. 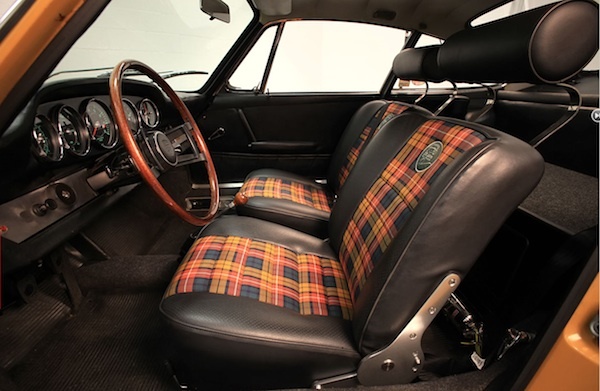 Once they'd been shaped the way he wanted them, the seats were then subjected to a fantastic recovering in "Buchanan" tartan plaid centers and perforated black leather surrounds. A custom 5-gauge cluster was accomplished by North Hollywood Speedometer, incorporating a higher redline on the tachometer, a 150 mph speedometer, and the combo gauges to the left of the tach were reworked to include a reading for oil pressure, and register the alternator's voltage output. To keep the new engine in check, a custom cooling system was incorporated, using a Carrera 3.2 fender-mounted oil cooler and custom lines from Elephant Racing. Of course a 911 oil tank was also required to make the project work. With all of that installed, surely cooling will never be an issue for this engine. Reliability is a very important factor in Pomares' choice of this engine, and he doesn't want to let the engine down. The original 5-speed transmission was rebuilt using close-ratio gears in a 914's lightweight magnesium case, and a Wavetrac limited slip diff was added for good measure. Stopping the car shouldn't be a problem, as period-correct Brembo brake calipers now clamp on vented rotors. Eric Shea of PMB Performance in Utah provided his extensive knowledge of braking systems to assemble the best package for the '912P'. The wheels were worked over to add an extra half-inch of width to the inside (taking a set of 16X6 wheels out to 16X6.5) before being completely refinished. Sticky Bridgestone tires were popped onto all four corners, aiding in stopping and cornering, to be sure. In the suspension department, a set of 911 SC torsion bars (19mm front and 24mm rear) keep the sprung weight in check. Koni adjustable absorbers provide a level, yet tautly damped ride. Finally, Elephant Racing was called upon again to provide a full boat set of their stiffer rubber suspension bushings. Precise and compliant were the aims of the suspension setup, and certainly these goals were met. The Porsche, having been finished about 2 years ago, is now for sale at Sloan Cars with an undisclosed price. 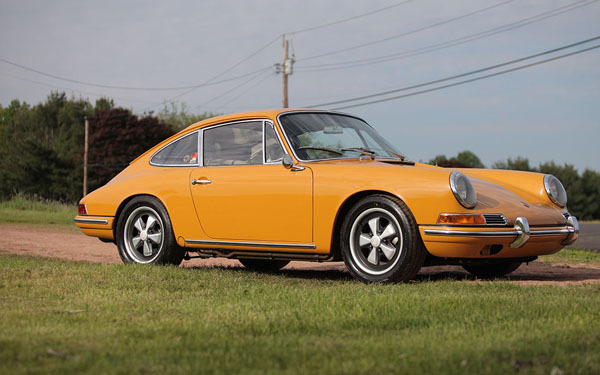 You can bet that it won't be inexpensive with Polo engines costing somewhere north of $30,000 to assemble, but if you've always wanted a car that will "handle like a 912, and go like a 911", then you'll need to pick up this Porsche. Undisclosed means “embarrassed”. Can’t take the heat. Thanks for the every nice article on the 912 Polo car! Dean’s shop is in Temecula, California. (north of San Diego) Richard Clewett who provided the engine management flew to Colorado and we did some ECU tuning on a dyno here at 5900 feet. The engines are now about 35K and the engine management another 10K. Excellent article on a wonderful upgrade for 356 devotees, thank you. The phenomenal Polo engine has been long needed considering the stretching of the original 356 pushrod four has reached it’s limits. Long live the 356. Jake Raby and others can build a torque monster for about half price. Parts are more affordable and what about spares? (LOL) Coming out of the woodwork. This is an interesting cool engine but it’s hardly affordable or practical. Of course affordable and practical don’t belong in any sentence with a sports car. Still cool! I have a RABY motor in my ’66 912… 158hp on the wheels… nothing better for that price. RABY? More information please. Robert I have a 69 912.